It’s easy to be put off building a home gym because you don’t think you have enough space at your disposal. Even if you are pushed for room, investing in a number of smaller, cheaper machines is better than viewing personal gyms as all-or-nothing affairs. If you deviate beyond the standard treadmill and weight bench, there are some innovative machines ideal if you have existing back pain or you want to prevent injuries from happening in the first place. In today’s Roman chair reviews, we’ll explore 5 of the most effective benches on the market in order to streamline your buying decision. We’ll also explore what to look out for when you’re on the buying trail. First up in our best Roman chair reviews is a commercially-rated model from Fitness Reality. If you’re looking to crack on with some heavy-duty training, it’s well worth investing in a solid, stable bench like this. Measuring up at 64 x 29 x 35 inches and tipping the scales at 55 pounds, this bench serves up the perfect balance of weight and portability. If you do need to shift your equipment around, the integrated transport wheels simplify this no end. Capable of accommodating users from 5 feet to 6 feet 4 and bearing loads of up to 650 pounds, this is certainly no lightweight. The steel frame is built to last and extremely supportive. This Roman chair also makes sure your comfort is uppermost. 2.5-inch padding offers more than enough cushioning even if you’re hitting the bench with a vengeance. Split thigh cushions deliver added support down below. The slip-resistant handlebars and rollers are also packed with padding to minimize any chance of abrasion or injury. 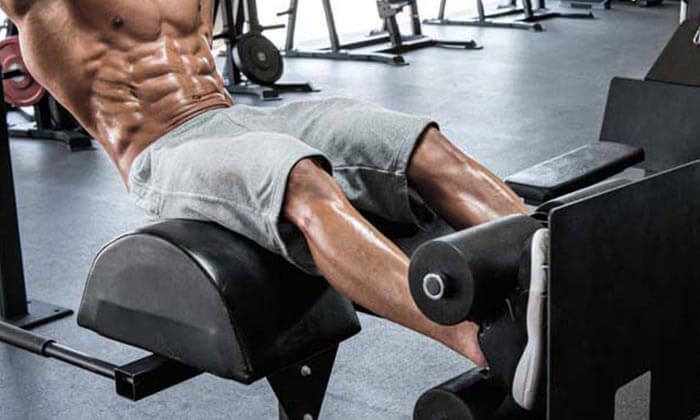 You can make 1 flat adjustment to the bench and 3 incline adjustments giving you plenty of leeway and stopping you getting bored with the same old routines. Dip bars are a nice touch if you want to torch your triceps and add another dimension to your workout. Although this is by no means the cheapest hyperextension bench you could find, it’s certainly up there with the very best. The frame is guaranteed for a whopping 10 years so you should consider this Roman chair as an investment rather than an expense. Next up is a mid-tier Roman chair from the highly reputable Powerline. This brand consistently put out hard-hitting gym equipment at pocket-friendly prices and this hyperextension bench is no exception. The classic design of this oversized frame makes it tailor-made for bigger users. The 2 x 2 steel and wide base gives you all the stability you need even if you’re vigorously training. You can focus on your form rather than being concerned about rocking or the bench toppling over. The maximum weight limit is 250 pounds. Weighing just over 40 pounds, you should be able to shift your bench around if you need to rejig your home gym. You won’t get any transport wheels but you need to accept some sacrifices at this price point. Proper padding is key with Roman chairs and the hardwearing vinyl is more than sufficiently stuffed. While a Roman chair is not meant to be an ornament, the powder-coated finish means this model looks lean and mean and will be an asset to any home gym. Aside from the truncated handlebar which could use some added length, there’s very little to say against this budget-conscious Roman chair. Even if you’re an accomplished athlete, you should get the support you need for more demanding workouts. From your abs and back through to your glutes, chest and hamstrings, you’ll be able to train in more ways than you could imagine with this simple but effective bench. The 10-year guarantee on the frame and 1-year coverage on all other parts shows clearly how this manufacturer stands behind their products. Road test this Roman chair today and start building up your back tomorrow. Next in our Roman chair reviews is an extremely affordable option from the industry giant Stamina. This bench comes with extra-thick cushioning so you can avoid any scrapes and scratches in the quest for a stronger back and core. The vinyl material is a breeze to wipe down when you’re done. The all-steel frame is finished in a striking red to set off any home gym a treat. You’ll get all the stability you need even if you’re hitting the bench hard. Non-slip caps under the frame put paid to any rocking or movement when you’re on the go. Comfort is at a premium on this bench despite the cutthroat price tag. Everything but the steel frame itself is densely padded with foam so you won’t scrape yourself up even if you’re pummeling those abs. You’ll also enjoy plenty of flexibility when it comes to adjusting your bench. The footrest and backrest can be easily tweaked to fit by pulling a pin and the pivoted, padded rollers are ideal to intensify your crunches. This Roman chair is perfect if you’re struggling for space at home. Maybe you haven’t got the room for a dedicated gym but you like the idea of some simple equipment you can pack away after use? This bench folds down quickly and fuss-free and you can tuck it away in a small closet when you’re done. While this bench works well for users up to 6 feet 4, if you’re slightly shorter you might struggle so bear this in mind. 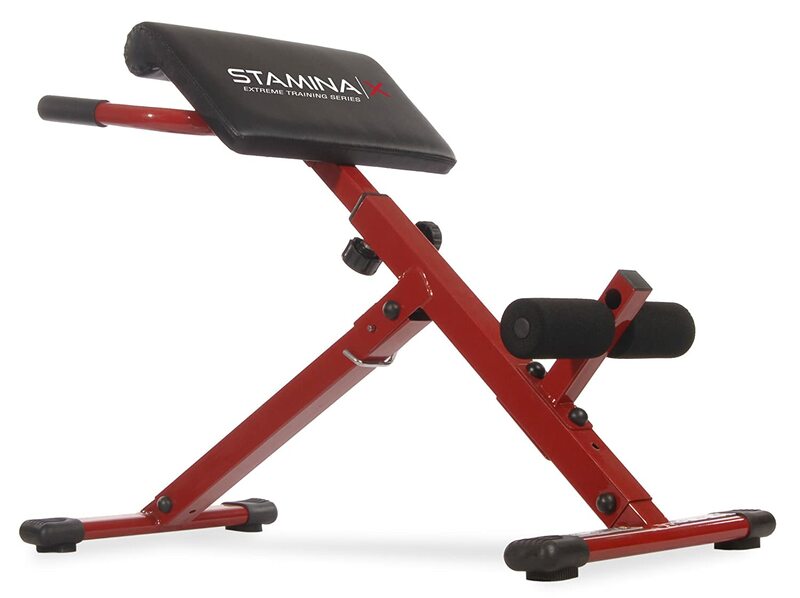 If you’re looking for a lightweight and ultra-compact Roman chair at a very affordable price point, you can’t go wrong with the Stamina Hyper Bench so check one out at your earliest convenience. As we near the end of our Roman chair reviews, we’ve got a significantly more expensive take on hyperextension from Body Solid. The first thing to be aware of before buying is that this bench requires a little time and trouble to set up. If you’re not very practically inclined you might be better off giving this a swerve. While this sturdy and stable Roman chair is not the cheapest option on the market, it’s certainly among the best if you’re looking to hone your abs or strengthen and condition your back. If you set the cost against gym membership, it suddenly starts to seem to excellent value. DuraFirm padding is a full 3 inches thick so you won’t pick up any scrapes or knocks when you’re training. 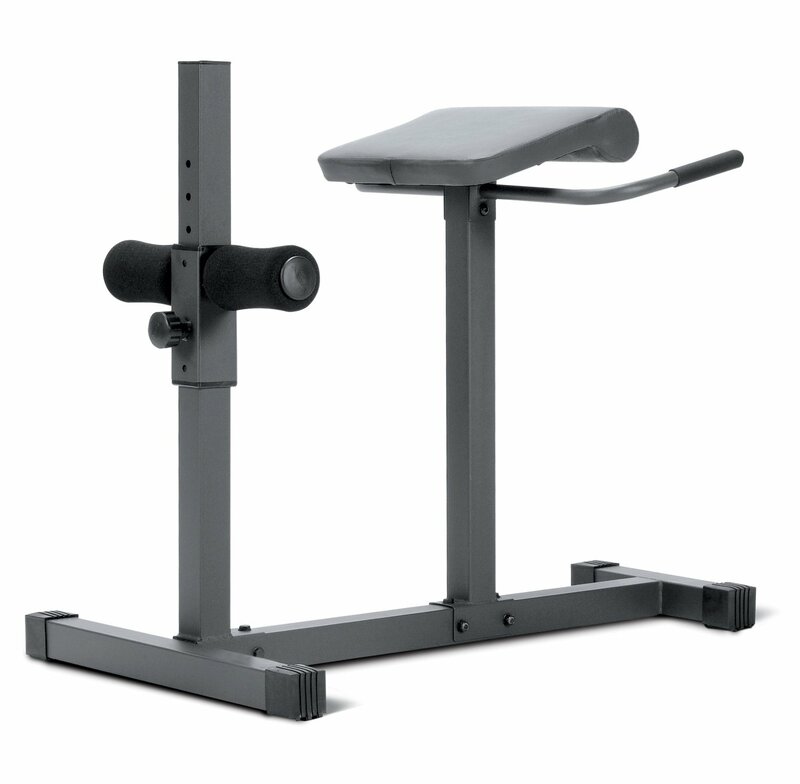 A heavy-grade steel frame means this hyperextension bench would happily slot into a small commercial gym as well as working well for home use. It weighs in at a hulking 75 pounds so make sure you have some assistance when you’re setting the bench up or moving it around. You can make adjustments to render this bench a comfortable fit even for taller users. As with all Roman chairs, you have a wide choice of workouts at your fingertips with the Body Solid. Whether you want to give ailing blood circulation a boost or rehabilitate a back injury, you can exercise with or without weights on this hyperextension bench and a great shot of low-impact cardio. If you’re still in any doubt as to whether or not this Roman chair represents great value, the lifetime guarantee removes any sting from purchase. Last but by no means least in our Roman chair reviews is an extremely inexpensive, no-nonsense bench from Marcy. From working on your core to strengthening your back, using a Roman chair is a great method of preventing and soothing back pain. This understated model from Marcy makes a great entry-point. 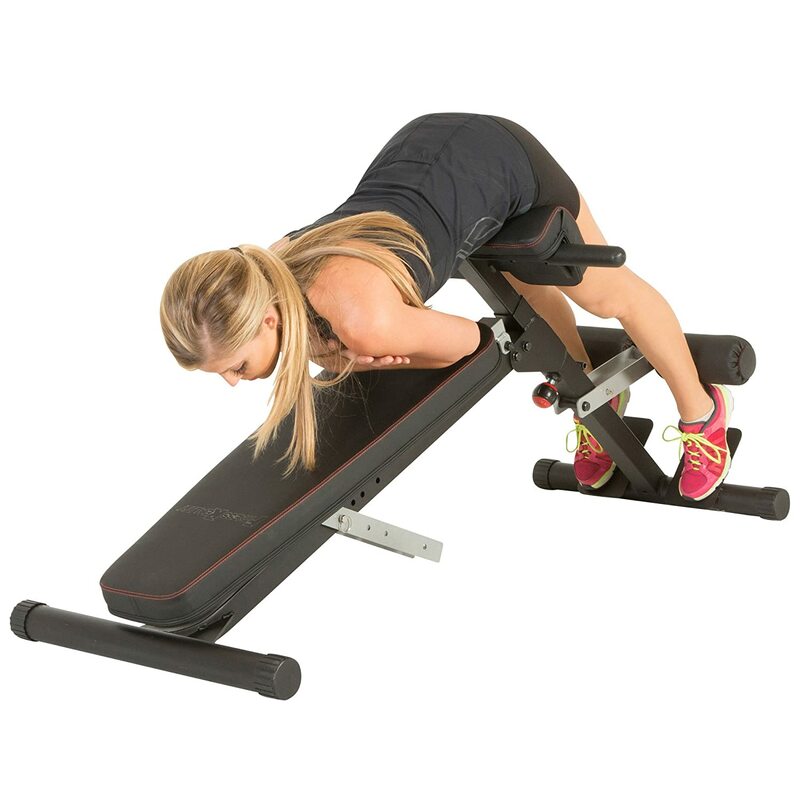 Unlike the Body Solid bench, you’ll be able to get going almost directly out of the box. Not only is assembly straightforward, this bench is incredibly compact given its rugged build. While the 2 x 2 steel tubing will withstand heavy loads of 300 pounds, it weighs in at just over 40 pounds and it won’t eat up too much real estate in the home gym. Stability is excellent for a cheaper bench and you’ll get no unsettling rocking even if you’re pushing yourself to your limits. The leather surface can be wiped down once you’re done and that’s where your maintenance ends. There are a few disgruntled customers complaining that the padding isn’t soft enough but this is to a large extent subjective. If you’re looking for something with the thickest possible cushioning, though, this is not your best bet. Dip handles are a nice touch at this price point so you’ll be able to extend the scope of your workout using these assists. You’ll be able to fine-tune the bench according to your height and the kind of exercises you’re carrying out. You can even adjust the ankle pads to really ramp up your core work. While this bench is clearly a functional piece of kit, the muted powder coating means it will look the part in any home gym. For anyone with simpler training needs looking for an entry-level Roman chair that will last for years, we can’t recommend this Marcy bench highly enough. Now you’ve got a solid overview of how 5 of the best Roman chairs can help you, we’ll go into a bit more depth so you can decide whether or not you really need one in your gym or whether you could make better use of the space. 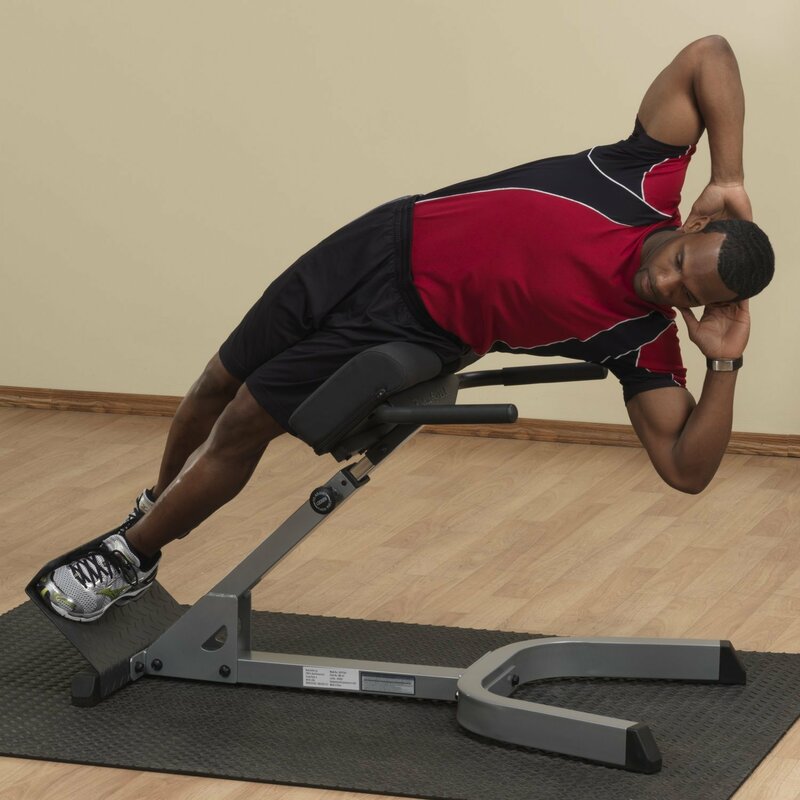 A hyperextension bench or Roman chair works out your back along with your core and legs. Perhaps you’re currently undergoing rehab after an injury and you’re looking to put in some work at home to complement your physio? Maybe you’re in the best shape of your life and looking to totally shred your abs? Whatever your level of fitness and whether you’re injured or in peak condition, the versatility of a Roman chair is one of its key selling points. Why Use a Roman Chair? Do You Need a Roman Chair? You can use the above pointers to determine whether or not a Roman chair would be of use to you. If you start by honestly analyzing your needs, you can save a potentially wasted purchase. Do you ever experience lower back pain? Do you want to strengthen your back? Do you have a sedentary lifestyle that’s prodding you into taking pre-emptive measures to stave off back pain? Do you want to work on your core, chest or hips? If you found yourself answering “Yes” to one or more of these questions, a Roman chair might be worth checking out. As with all gym equipment, there are a few things to factor into the equation if you’re hunting for the best Roman chair. You should look for a unit that is lightweight enough while still remaining perfectly stable. You shouldn’t try to cut corners looking for the cheapest Roman chair you can find. A flimsy and unstable unit can move around under heavy use and possibly even end up flipping over so do not stint on build quality in the pursuit of a bargain. It’s crucial you can make height adjustments to your hyperextension bench. Height needs to be bang-on if you want to enjoy proper usage of your chair the way without risking injury. You shouldn’t overlook comfort when you’re searching for a Roman chair. If the padding is too thin, you can end up with pressure and pain on your back, core and legs. You should focus fully on a deeply padded bench so you can enjoy a fully cushioned workout. There’s no escaping the fact you’ll sweat if you put your hyperextension bench properly through its paces. Look for equipment with removable covers with material that’s easy to wash and very absorbable. The main accessory that comes with a Roman chair is a dip bar. If you need added functionality, make sure you scope out models that offer exactly what you’re looking for. The main purpose of a Roman chair is to help you work out your lower back using hyperextension. You’ll also work secondary muscles as you’re doing this. From your abs and your glutes through to your shoulders and legs, you can get something close to a whole body workout with one nifty piece of equipment. The inbuilt advantage is you can get all this versatility in one very small and lightweight piece of kit. You’ll be able to reap maximum gains without needing a mansion to house your equipment if you invest in a Roman chair. The ability to tweak the height makes a single bench useful for the whole family. With certain models you can also make other minor adjustments to ramp up the challenge. Prevention is the best cure and using hyperextension to exercise is a surefire way to beat off back pain before it has chance to take effect. Roman chairs are particularly valuable if you’re lifting heavy weights. If you keep on pushing yourself and at the same time neglect your lower back, it’s a recipe for disaster. 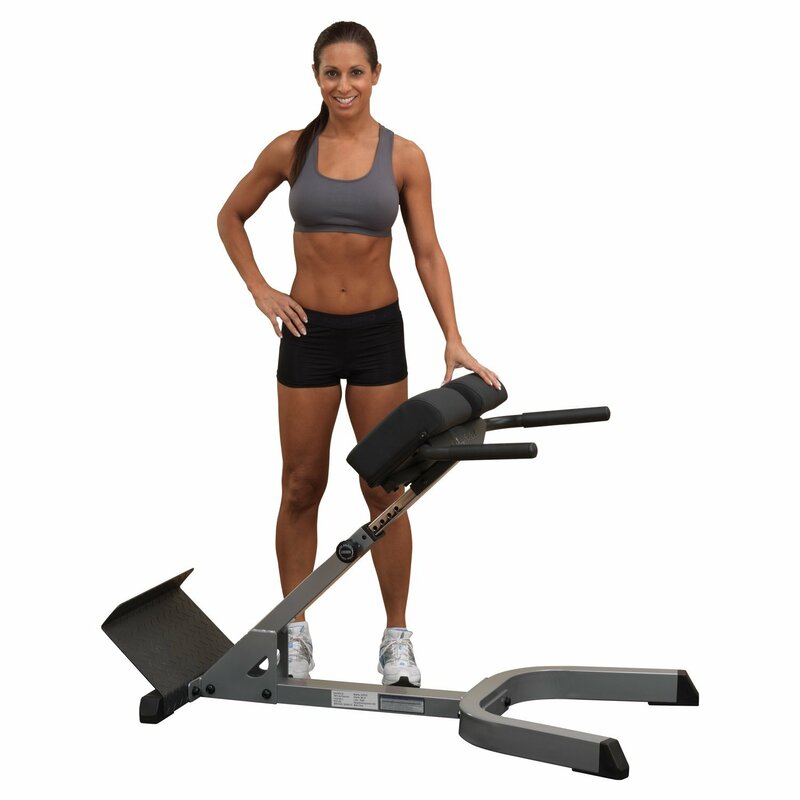 Train that muscle instead using a hyperextension bench to keep your back in peak condition. If you’ve sustained a back injury, before Kickstarting any form of training or therapy, you should always consult your doctor. Mention that you’re considering using a Roman chair to help alleviate that pain and check that it’s safe for you to do so. With more and more people working in sedentary and home-based jobs, it’s all too easy to forget the importance of posture. Slump for too long in front of a screen with improper exercise and you could find your posture takes a nosedive. From back extensions to abs workouts, strengthening your core to your lower back, you can start putting that poor posture to rights with the manifold benefits of hyperextension. We hope you’ve found a Roman chair that meets your fitness goals today and you have a clear idea of whether or not you’d benefit from one of these benches in your home gym. Think about a price and stick to it then check out our Roman chair reviews and you’ll be embracing hyperextension and realizing its many benefits. Always feel free to get in touch if you have any feedback or questions at all. We love hearing from our readers and we’re always ready to help in any way we can. Now take care of that back and come back soon!